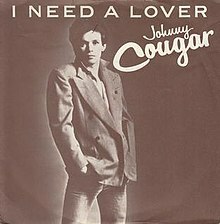 (1979) "I Need a Lover"
"I Need a Lover" is a rock song written and performed by John Mellencamp and first released under the stage name Johnny Cougar. It appeared on his 1978 album A Biography, which was not released in the United States. After becoming a Top 10 hit in Australia, the song was later included on his 1979 follow-up album John Cougar to introduce it to U.S. audiences, and it was released as a single, becoming his first Top 40 hit in the U.S. when it reached #28 on the Billboard Hot 100 in late 1979. AllMusic reviewer Stephen Thomas Erlewine described "I Need a Lover" as Mellencamp's "first good song." Mellencamp has stated that "I Need a Lover" was inspired by The Rolling Stones' 1972 song "Happy." Hamilton Leithauser (of indie rock band The Walkmen) performed a version of the song in August 2014 for The A.V. Club's A.V. Undercover series. (1980) "I Need a Lover"
The song was covered and released as the debut single in 1980 by American rock singer Pat Benatar for her debut studio album, In the Heat of the Night (1979). The song became an album-oriented rock radio hit for the singer. ^ a b "John Cougar: A Biography: review". allmusic. Retrieved October 21, 2010. ^ Stephen Thomas Erlewine. "John Cougar: A Biography: review". allmusic. Retrieved October 21, 2010. ^ Whitburn, Joel (2004). The Billboard Book of Top 40 Hits (8th Edition). Billboard Books. p. 418. ISBN 0-8230-7499-4. ^ Modell, Josh (August 12, 2014). "Hamilton Leithauser covers John Cougar (and he's playing A.V. Fest)". The A.V. Club. Onion, Inc. Retrieved August 12, 2014.